The ground begins to thaw, the sun shows its face more often, and the world goes from white to vivid colors. It must be springtime in West Michigan, and oh, is it glorious. We appreciate the climate change a bit more here in Michigan, and after the long, cold winter, spring feels so good! Now is when the golf courses open, the bikes come out, and the S.S. Badger starts her engine for the first cross-lake journey of the year. The warmer temperatures are perfect for a leisurely stroll, especially along our beaches. It's a sign that our community is gearing up for the busy summer season, so we take the time to enjoy the quiet splendor of our beautiful region. Silver Lake Sand Dunes -- Visiting the Silver Lake Sand Dunes makes for a terrific vacation because you can take your off-road vehicle for a spin on the scenic sand dunes overlooking Lake Michigan and Silver Lake. Guided tours of the dunes are also available. 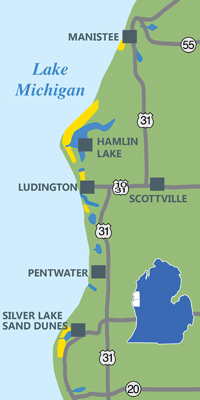 Lots of Activities in Scottville, Michigan -- Explore the Riverside Park along the National Scenic Pere Marquette River or enjoy the Summer Concert Series, which includes a performance by the famous Scottville Clown Band. Canoeing or Fishing on the Pere Marquette River -- Many boat liveries offer canoe or kayak rentals, so you can leisurely navigate this National Wild and Scenic River. Also, check out West Michigan Guides and our locally produced WestMichigan.MichBiz.com for a larger list of Things to Do in West Michigan.